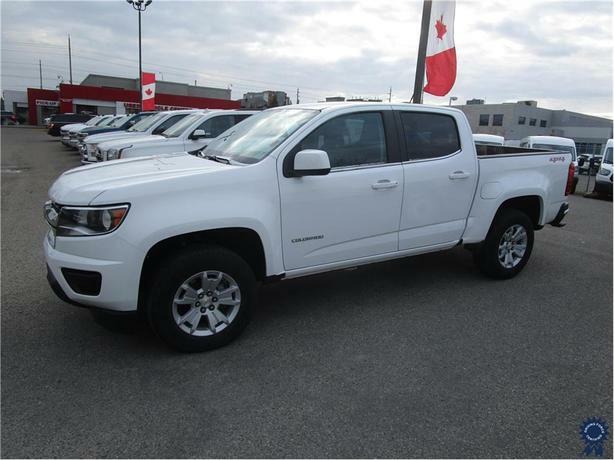 This 2015 Chevrolet Colorado LT Crew Cab 5 Passenger 4X4 5.2-Foot Short Box Truck has a 128.3-inch wheelbase, 6-speed automatic transmission, Z82 Trailer Tow Package with 3.42 rear axle ratio, tow/haul mode, 17-inch blade silver metallic cast aluminum wheels, summit white exterior color, cloth seat trim, Chevrolet MyLink 8-inch Diagonal Color Touch Screen with AM/FM/SiriusXM satellite capable radio, 6-speaker audio system, automatic locking rear differential, engine block heater, all-weather floor mats, plywood bed liners, Bluetooth hands-free calling, Apple CarPlay/Android Auto, USB power ports, steering wheel audio controls, 4-way power adjustable driver seat with manual recline, front tow recovery hooks, WiFi hotspot, locking tailgate, balance of factory GM/Chevrolet warranty, a clean CarFax vehicle history report, certified to our high standards with a 120 point inspection and GVWR rating of 6,000 lbs (2,722 kgs). The 3.6-litre V6 gas engine provides 305 horsepower at 6,800 RPM and 269 lb-ft of torque at 4,000 RPM. Touch base with us to discuss purchasing or financing options that are right for you and experience the difference you will only find at DRIVING FORCE Vehicle Rentals, Sales and Leasing.